Paenungulata is rather new group within the classification of elephants ancestors, and is supported by DNA-research (reference-link). The DNA-tests has made it clear that the hyraxes branch off earlier, while proboscidea and sirenia still unite in Tethytheria. 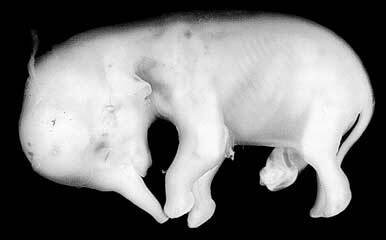 Elephant embryo, estimated gestation 58 days. Recent Studies (1999) of african elephant fetus indicates that the elephants may have developed from aquatic animals, and that they are closely related to the Sirenia (dugong and manatees), and that the order Proboscidea ("trunkanimals") and the sea cows (Sirenia) must share a common ancestor. Link: The developing renal, reproductive, and respiratory systems of the African elephant suggest an aquatic ancestry (Gaeth, Short, and Renfree, University of Melbourne, Parkville, Victoria 3052, Australia). This suggest that Elephants are not so closely related to hyraxes as was thought before, but definitely close related to Sirenia.